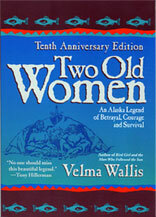 LitSite Alaska has designed this section for Alaskan educators teaching Velma Wallis’s award winning novel Two Old Women. The goal of this site is to provide an array of educational material to supplement instruction of this classic Alaskan tale of culture, adventure, and survival. All page numbers in the content provided refer to the Tenth Anniversary Edition of Two Old Women. Chapter by chapter discussion questions for teaching Velma Wallis's award winning novel Two Old Women. Chapter by chapter reading comprehension questions for teachers. A collection of assignment ideas and student examples inspired by Two Old Women. We hope this list of potential assignment ideas will grow with contributions from other teachers. Links and related materials for Two Old Women.